This document provides the academic results for the schools in the Ohio High School Athletic Association (OHSAA) basketball semi-finals. To-date, school academic results have not been included as a factor in the Competitive Balance discussion. Academics should be a significant factor since the quality of education varies considerably by school and because it is one of the most important factors for most families when selecting a high school. The purpose of this document is to bring academics into the discussion. Another reason for doing this is to help readers gain a better understanding of each school's academic performance. As fans review basketball box scores, they carefully analyze each player's field goals, field goal attempts, free throws, free throw attempts, rebounds, assists, and three-pointers to identify strengths and weaknesses within each team. This report and the underlying links should help basketball and academic fans to identify strengths and weaknesses in each school's efforts to prepare students for the Ohio Graduation Test subject tests. This document is based on the Ohio Graduation Test (OGT) results for Ohio's public (tax payer-funded) and private (customer-funded) schools for the March 2013 test. To insure an apples-to-apples comparison, only the tenth grader results are included. 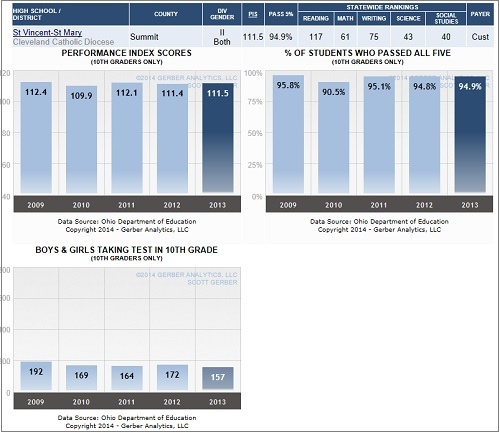 The statewide rankings range from 1 to approximately 991 in each subject and they are calculated using the Performance Index Score within each subject area. The rankings provide readers with not only academic performance information between schools, but they also identify strengths and weaknesses within schools. Click here to go to the Appendix to view the PIS calculation. See below for more information about the rankings. Note that the table is long -- it contains detailed data for all of the schools that reached the basketball semi-finals. These schools are initially sorted according to their Gender and Division, but they may also be sorted by school name, county, Performance Index Score, or the Pass All Five Test %. Click on a link above to change the sort order. Click here to return to a Gender / Division sort. St. Vincent-St. Mary had both its girls and boys teams in the semi-finals. Viewing five year trend charts are a great way to evaluate schools. Normally, this amount of information is not shared in these series of documents, but an exception will be made this time. Click on the following link to view the graphs for all of these schools. Click on the next link to return to normal viewing. Note that these graphs only reflect those students who took the test as 10th graders. Also note that these graphs are for boys and girls. To easily visualize the basketball semi-final schools and all Ohio schools, click the map image below for the Northwest, Northeast, Central, Southwest, and Southeast / East schools. Schools are color-coded by academic performance using the Performance Index Score. A major benefit of the Internet is that it is relatively easy to improve existing products and services. This report will likely be enhanced over time. The date of the report will be changed to reflect any changes.